They say first impressions count and it is true, especially when a guest walks into your home for the first time. The way a hallway is styled creates the first impression and speaks volumes on what the rest of a home’s interior will look like. Walking in through the front door, the general atmosphere of your foyer must be pleasant, warm, and welcoming. It must be ‘dressed up’ whether space is small or ample. It must be styled just as well as the living room and depending on its size can be decorated minimalist, traditional, or contemporary. 2. What function will your hallway serve? 3. What is your preferred theme or style? 4. What kind of furniture and furnishings are appropriate for your chosen style? 5. What’s your colour scheme? 6. Do you have natural daylight filter into your hallway (or not)? 7. Does your foyer flow into an adjoining room like the living room for instance? Available space – It is true that an entryway’s design depends on the space you have in this front room. All that’s required is to ensure that the furnishing items you choose are the right scale for the available space. You can also paint the skirt boards to match the colour of the floor; this technique will increase the apparent width of any small hallway. Larger foyers are much easier to style with enough space to add an accent chair or two. Function - Does your home's foyer serve as a place to dump muddy boots, drip-dry wet umbrellas, or store the kid’s bike? Is it just a space that serves no function except as a thoroughfare? 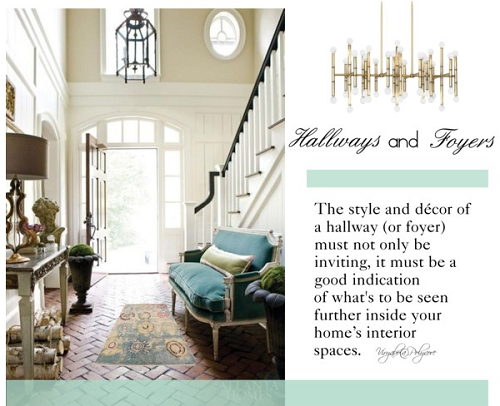 If your hallway or foyer serves for any of these then you need to re-think its purpose and style it up. Style - Deciding on a theme is not so hard. You can have the space designed with a contemporary or ultra-modern theme in mind. If you are somewhat adventurous, you’ll probably love the eclectic, bohemian, or tribal look and for those who love the classic look, you can have a traditional themed style . . . a country, Victorian, or mid-Century modern. 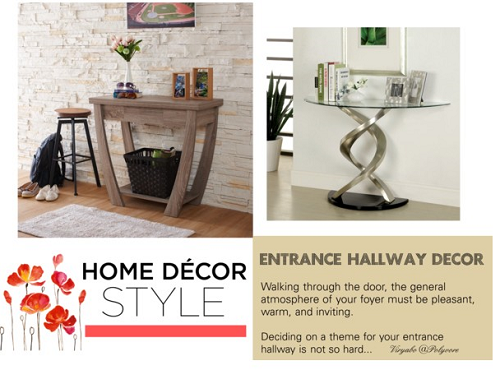 Furniture and furnishings - Decorate your entry hall nicely by starting with a console table. You can use an accent table for any chosen theme but ensure that the table style goes hand-in-glove with your desired style. Choose a small sleek one for a small hallway if you don’t have much space. Liven the space up with a wall mirror, framed painting, or a collage of framed photographs placed on the wall above the console table. Add a table lamp, your favourite objects, collectibles, and decorative items on the tabletop, and place an accent chair (or two if space permits) on the side. Warm up the look with a runner rug. Colour scheme – A hallway’s colour scheme must be cheerful and warm at the same time, and you should use rich colours effectively without creating a claustrophobic feel. Tones of primrose yellows, subtle rose, deep wines, and burnished gold or chestnut browns can be used to create an elegant effect. And for a sunnier feel with a strong stimulating effect, you can use primary colours, like orange, red, sunflower yellow or bold vibrant pink colours. The trick is to use colour contrasts for a maximum effect, so you can introduce colours into wall finishes, fabrics or floor finishes, introduce colour accents in the wall pictures, mounts, decorative frames and moldings, introduce stained glass panels (decals are great for this effect), or display bright and pretty coloured glass décor objects on glass shelves. Natural or artificial lighting – In most hallways, glazed entrance (front) doors help ‘throw’ in natural light. If you can, it’s a good idea to have your front door partially fully glazed. Glazing also adds character not only to the facade of the house but to a foyer as well. Remember to consider the security of glazed and partially glazed front doors. 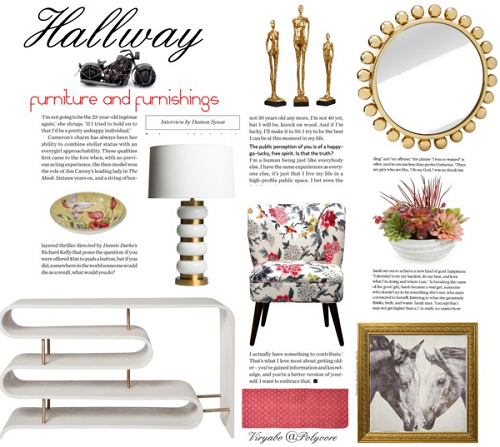 Adjoining room or space - Plan your hallway to relate stylishly to the next room or space. To achieve this, ensure you maintain a visual flow. You don’t want to create an abrupt change between . . . for instance the foyer and the living room. Ensure there is a transition between colour schemes of the entrance hallway and the adjoining room. This enhances continuity in theme, scheme, and design.